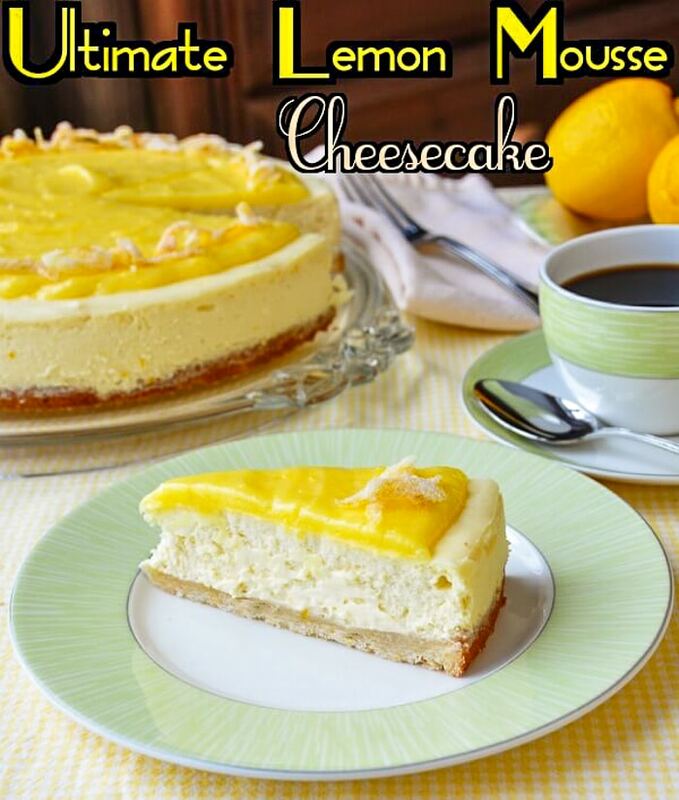 Ultimate Lemon Cheesecake - satisfies all lemon cravings! 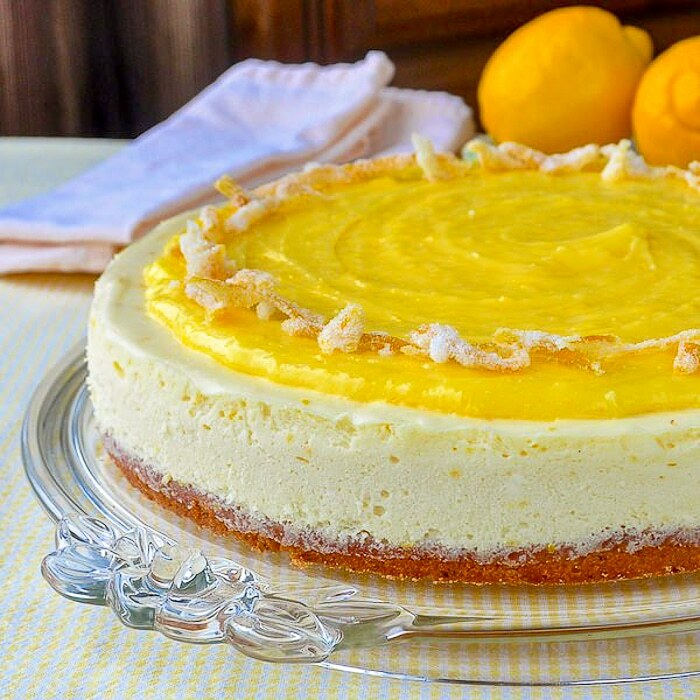 The Ultimate Lemon Cheesecake recipe has a lemon cookie base, lemon mousse cheesecake body, lemon curd topping and garnish of candied lemon peel. That will satisfy any lemon lover out there. 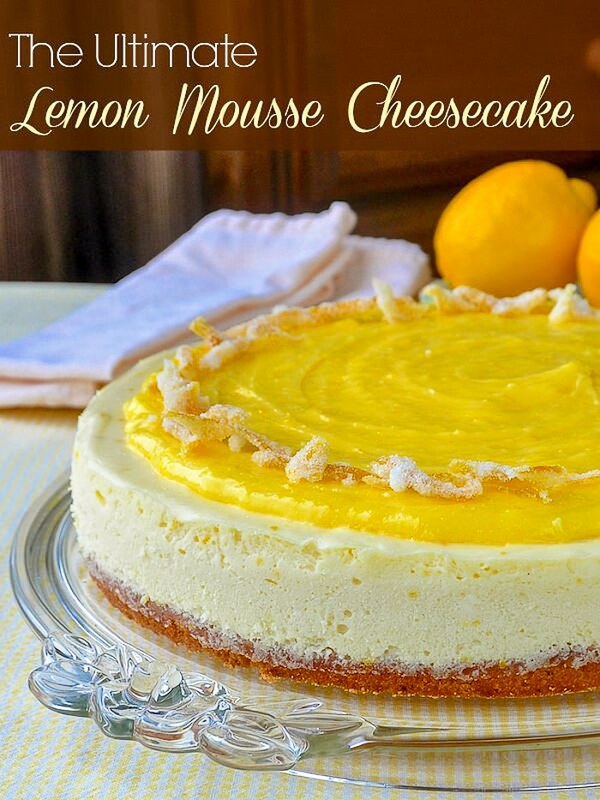 Scroll down in this lemon cheesecake recipe post to find links to 7 other delectable Lemon Desserts…from Classic Lemon Tart to Lemon Blueberry Cream Cake. If you are a cheesecake lover and a lemon lover, this lemon cheesecake is your ultimate dessert. I started with a simple, buttery, lemon shortbread cookie base and topped it with a creamy lemon cheesecake. Here, whipped cream gets beaten to soft peaks before being folded into the cheesecake batter. A tart and sweet homemade lemon curd tops it all of before being garnished with candied lemon zest. Truly the ultimate tart and sweet, lemon lovers dream dessert. A word about baking a cheesecake in a bain marie before starting the recipe. A bain marie is simply a water bath that buffers the direct heat from the sides and bottom of the baking pan to more evenly bake the cheesecake from the sides to the centre. I bake my cheesecakes in a 9 or 10 inch spring form pan that has the bottom and sides wrapped in multiple layers of wide heavy duty aluminum foil which forms a sort of boat that the cheesecake pan sits in. The roll of aluminum foil that I use is about 16 inches wide. I use at least 4 layers of foil to make sure that no water leaks in and ruins the crust of my cheesecake. The aluminum foil wrapped pan is then placed inside a larger baking pan; I use a 12 inch cake pan. Boiling water is then poured into the larger pan filling it from 1/2 to 2/3 of the way to the top. I find it best to pour the boiling water into the pan after it is placed on the rack in the oven as you are less likely to splash water onto the cheesecake or inside the aluminum foil. I reuse the aluminum foil for several future cheesecakes, adding a couple of layers to it each time just to be safe. Even if you choose not to use the bain marie method, wrapping the spring form pan with a few layers of foil, really helps to buffer the heat and help the cheesecake bake more evenly. Want even more delectable lemon dessert ideas? 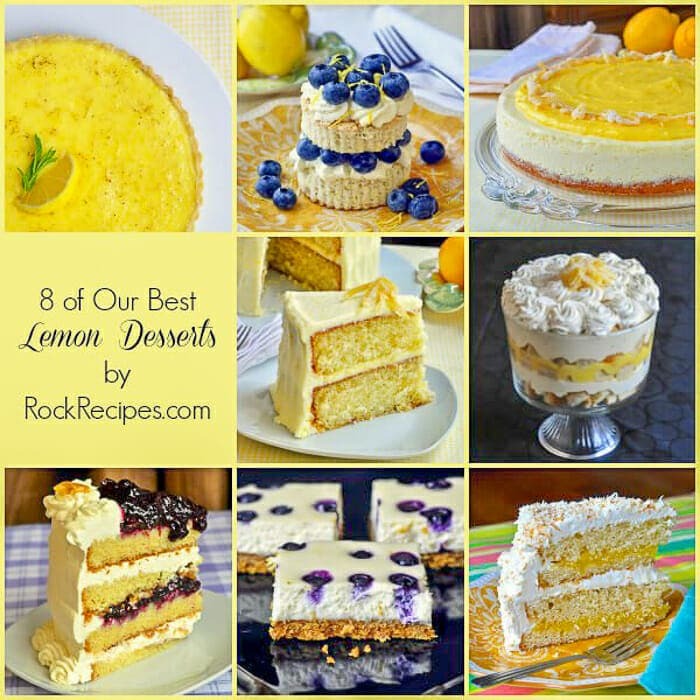 Click the links below to see some of the most popular Lemon desserts ever on Rock Recipes. 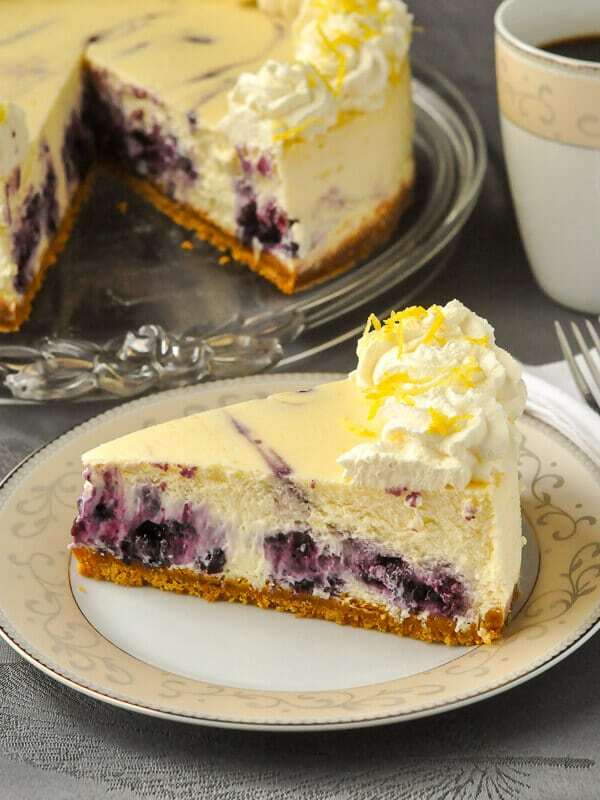 PLUS Try our latest lemon hit Lemon Blueberry Swirl Cheesecake. Like this Lemon Cheesecake recipe? Sift together the flour, icing sugar and salt. Mix in the lemon zest. Set aside. Whisk together the egg yolk and lemon extract Add to the crumbly dry mixture and mix in until a soft dough forms.Wrap the dough in plastic wrap and chill in the fridge for at least a half hour. Press evenly into the bottom of a parchment paper lined 9 or 10 inch spring form pan. Dipping your fingers into flour helps if the dough is too sticky. Bake at 350 degrees F for 25-30 minutes. Let cool for 15-20 minutes before adding the cheesecake batter. Cream together the cream cheese and sugar. Add the eggs, one at a time, beating well after each addition, then beat in the vanilla and lemon extracts. Whip the whipping cream to soft peaks and fold it in gently by hand along with the lemon zest, using a rubber spatula. Pour over the prepared and cooled base and bake in a bain marie at 300 degrees F for about 1 hour and 15 minutes. The cheesecake does not have to brown at all in order to be fully baked; the surface of the cheesecake should lose any shine when the cake is properly baked. It can still be slightly wobbly just at the center at this point. Remove the cake from the oven and run a sharp knife completely around the edge of the pan. This will allow for the cheesecake to shrink as it cools and hopefully not crack (but who cares if it does? I am never bothered by a crack or two in the surface) Allow the cheesecake to cool thoroughly on a wire rack at room temperature for an hour or so before cooling it completely for a few hours or overnight in the fridge. In a small saucepan combine the egg yolks, sugar, lemon juice and lemon zest. Remove from heat and stir in the butter a few pieces at a time until completely smooth. Cover with plastic wrap and chill completely in the fridge. Spread evenly on top of the chilled cheesecake and garnish with candied lemon zest. Remove the zest of the lemon in large pieces using a sharp vegetable peeler. You want to avoid using too much of the pithy white layer. Add to the saucepan along with the 1 cup of sugar, water and lemon juice. Simmer very slowly for 15 minutes, then remove the candied zest from the syrup and let it drain on a wire rack.When drained cut it into thin strips and toss it in the additional sugar. Let sit for a half hour or longer before using as a garnish. Note: This candied zest can be stored in the sugar for several weeks in a mason jar. Don't throw out the sugar! Use it to make lemon shortbread cookies or when making lemon pound cake. The syrup can also be stored for a couple of weeks. Use it to brush on a lemon pound cake or even as a delicious substitute for maple syrup on blueberry pancakes. ndations are almost exclusively for those we currently use or have used in the past. Made this fort family foodies-and everyone loved it. Takes a bit of time to prepare but worthy! Can you make the lemon curd the night before applying go cheesecake? Yes, I often make lemon curd a day ahead. Made this for my daughter’s birthday and the whole family loved it! So moist, lemony and delicious. And I made the cheesecake and the custard and candied lemon peel on separate days, so it wasn’t too onerous. Thank you for a great recipe, it’s a definite keeper. Can this be made a day or two ahead of serving it? Can it be frozen? Couple of days ahead is fine. Freezing is fine but any garnish should be added when thawed. This is exactly what I did. I’ve come to trust your recipes to the point where I made this for the first time as dessert for Christmas dinner. (The ultimate trust exercise, right? LOL!) It was FABULOUS! It was rich but light at the same time, and a lemon-lover’s dream-come-true. Thank you, Barry, for adding the sparkle to our special dinner! Always happy to be a small part of any celebration!